The Museum of Packaging also known as the Museum of Brands, Packaging and advertisement is located in London and open since 2005. Located within a 2 minutes’ walk from Portobello Road in Nothing Hill it has a collection of more than 12000 original objects, in particular household items as well as popular brand products etc. 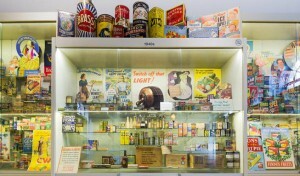 The museum shows the history and evolution of consumption since the Victorian era until nowadays. The museum was created thanks to the initiative of Robert Opies who is the current Director of the Collections. Since the age of 16 he’s been passionately collecting visual advertisement and household objects. He has more than 500 000 items which he houses, between 1984 and 2001, in the “Museum of Advertising and Packaging” of Gloucester and set in London in 2005. This “Ali Baba” cave exhibits, in a long zig-zagging corridor, all kinds of household items from daily life from the 19th and 20th centuries as well as some popular brands that we know. The visit starts with the industrial revolution which leads the developed world into the era of mass consumption. At first, advertisement was mainly oriented towards men. Since 1903 we see the Typhoo brand. Then in the 20th century we note the appearance of instant soluble drinks such as Nescafe in 1958, the Swiss Ovomaltine registered in the UK since 1909 by mistake as Ovaltine. Chocolate is spreading in bars under the brand Cadbury since 1900. The more we go further in time, we see the appearance of brands for toys during the 1960s – 1970s, testifying of a society with leisure activities. Mattel’s Barbie doll in 1959 is the most symbolic example of all times. We can also find historical events which have an impact on the world such as the World cup or the Muppet Show represented by Kermit and Miss Piggy. Nowadays the museum’s interested in topics related to the environment. It underlines the importance of packaging and its evolution and shows that producers, engineers and designers work hand in hand in order to find new and sustainable solutions for the industry and thus preserve the nature. The aim is to educate the public and the final consumer and give them the key to a better understanding and better usage of resources. You can visit the museum every day of the week except Mondays. For further information please visit the museums web site here. Tagged as advertising, brands, Museum of Packaging.